Recorded by Larry Packer @ Uncle Punchy Studios in October 1991. Additional guitar work by Mark Stanley and Scott Crawford. Released on Black, Gold, and Clear vinyl. There was also a misprinted black 7" released that had track listings on both labels instead of just one side. The "Test Pressing" mentioned in the Inner Journey Flyer is on Black Vinyl, and comes in a red paper sleeve that says "Far Country Test Pressing" on it. (Pitchfork was originally called "Far Country"). The "St. Ides Pressing" was just going to be Pitchfork printed on a malt colored vinyl. (Apparently some members of the band and the IJ crew had a fondness for that particular beverage. Who could blame them?) 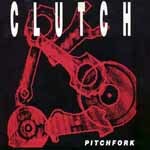 It also mentions a Clutch Anthology CD which was never released to my knowledge.